• Join multiple videos and combine them into one. • Split one video into several segments. • Cut off the unwanted segments of your video. • Crop off the unwanted regions of your video. • Add subtitle to your video. • Add text or image watermark to your video. • Adjust video effect- brightness,contrast,saturation. • Rotate video 90/180/270 angel. • Support XP/Vista/Windows 7/Windows 8. Supports all key video formats. 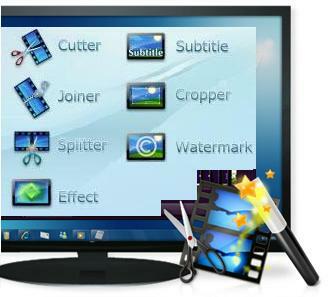 Edit and save video files in AVI, VOB, MP4, DVD, WMV, 3GP, MOV, MKV, H261,H263, H264, etc. • Insert subtitles, text watermark, picture wartermark. Timeline-based video editing provides precise control over every element. Split manually by dragging the slider to locate the split point. Or split automatically by setting split time or file size, or averagely. The comprehensive video editing software provides many detailed parameters including frame rate, video bit rate, and resolution. By setting them, you will get expectant effects in a short time. The video editor provides large preview window for you to preview the original and the output file. You can join many videos in different formats at one time and the format of output file will be one of the input formats. Q: How to split video/audio clips into separate scenes? Q: How to cut favorite segments from video/audio files? Q: How to merge several video/audio files into a single file? Q: How to crop video? Q: How to add subtitle to video? Q: How to add watermark to video? Copyright (C) 2005-2013 GiliSoft International LLC. All rights Reserved.